Painting is one of the oldest media for conveying narrative, and for much of human history since has been much more accessible to the general population than written narrative, as it requires no special skills. Yet it is one of the most neglected areas in the literature on narrative. The recent discovery and analysis of cave paintings from southern France, dated to 36,000 years ago, is believed to show a volcano erupting: a piece of narrative as it depicts an event, not simply a view. Other cave paintings elsewhere show hunting scenes, again events in a narrative. We cannot know the purpose of these paintings, nor whether they were used to support oral narrative, perhaps. 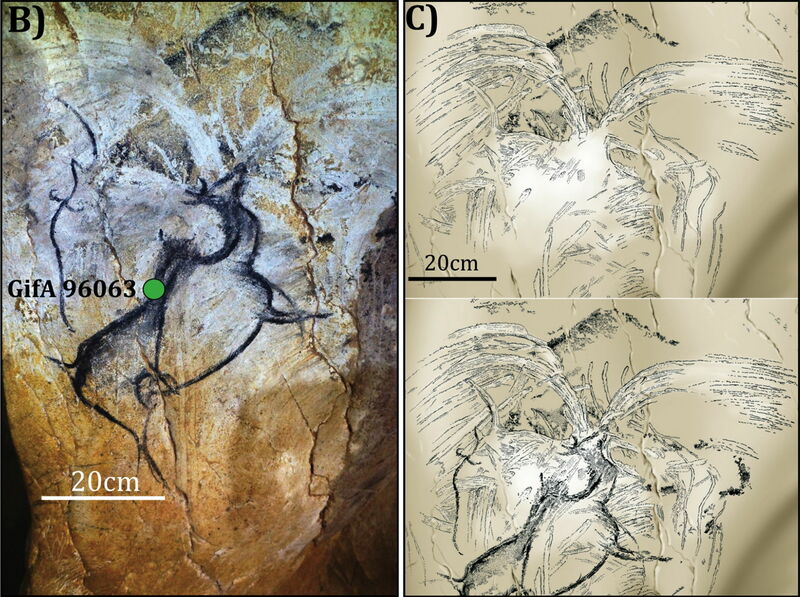 Anonymous, Volcano in Eruption (c 36,000 BP), pigment on limestone mural, 60 x 60 cm, Chauvet-Pont d’Arc Cave, Ardèche, France. B is the original panel (date sampling site shown in green), and C the constructed time sequence of layers. The photo in B was taken by D Genty, and the images in C by V Feruglio and D Baffier. These images are © 2016 Nomade et al. With low literacy rates until relatively recently, paintings and derived prints have been second only to oral narrative in their accessibility to the general population. Many paintings – those not owned by rich patrons, in particular – were in places of worship, where the faithful congregation could gaze at them and reiterate the oral narrative which surrounded the holy image. When prints became more widely available after 1500, so the range of narratives broadened beyond bible stories and the lives (or, rather, deaths) of the saints. Narrative painting, of biblical/religious scenes, myths, and history, remained the most respected of the genres of painting until the nineteenth century. Although it had no coherent manifesto or theory, one of the main effects of Impressionism and Post-Impressionism was to take narrative out of paintings, and much of modernism relegated it from art altogether. Yet later in the twentieth century, narrative has returned to the works of many painters. Being a still image, any single painting expresses a single moment in the narrative, and the viewer has to supply the remainder from their memory and imagination. This is unusual for narrative media, and appears contrary to the whole concept of narrative being a series of events occurring through time. It is the major determinant of what narrative can be represented in paintings, and how successful such representation can be. 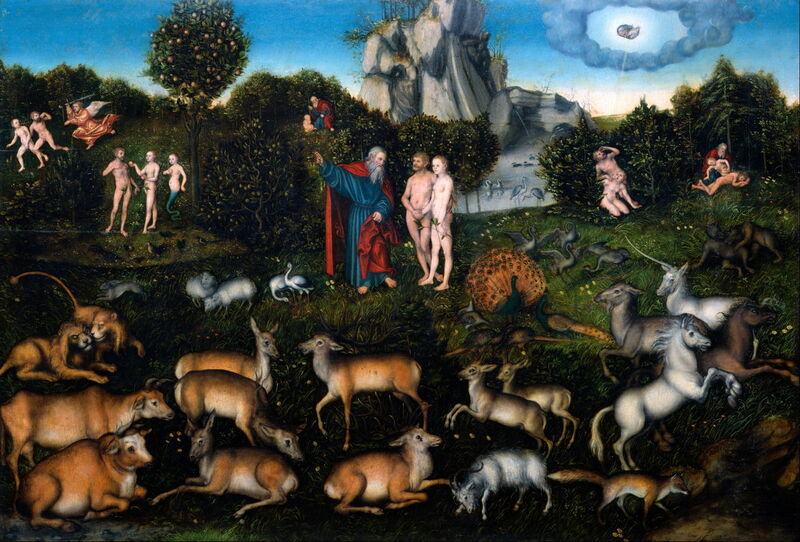 Lucas Cranach the Elder (1472-1553), The Garden of Eden (1530), oil on lime, 80 x 118 cm, Gemäldegalerie Alte Meister, Dresden. Wikimedia Commons. There are tricks which have been used to circumvent this limitation. In Lucas Cranach the Elder’s The Garden of Eden (1530), he has shown no less than six different scenes of the Fall of Man in the one painting, making it almost the first ‘comic strip’. It is more common for a single image to contain some graphic elements from the preceding events, and some cueing those subsequent. Artists could also use the multiple images of a diptych, triptych, or even larger assembly of individual paintings (as in an altarpiece) to extend the explicit part of the narrative. In addition to requiring the viewer to supply the rest of the narrative, and in contrast to its visual explicitness, narrative paintings do not usually convey speech (sometimes text inscriptions are added, though) or any other sound, which is left to the viewer’s imagination. Because a single painting can only show one moment in a narrative, the great majority of traditional narrative paintings show very well-known stories, with which their viewers would be extremely familiar. This made it an easy task for the viewer to remember the elements of the rest of the narrative, and ‘read’ the painting correctly. Many people also find great comfort in revisiting such familiar narratives, much as they do in retelling myths and fables. Another common technique is to use objects and passages which are iconic or have commonly-known symbolic associations. 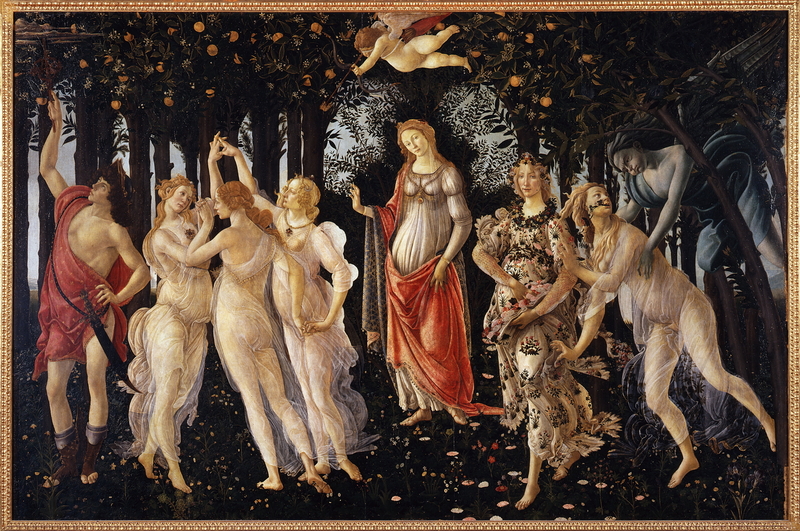 Today these can appear quite obscure, and need interpretation in the light of the culture of the day: a good example of this is Botticelli’s Primavera (Spring) (c 1482), which I have explained here. In some combinations, these become allegories, which are another form of narrative seen in paintings. When the narrative is unfamiliar, personal to the painter, obscured or concealed, it becomes far more difficult or even impossible to read. Some viewers relish that challenge, and have no problems in dealing with multiple readings; however, others will not even attempt it. Personal and obscured narrative is more characteristic of twentieth century paintings. For example, many of Paula Rego‘s enigmatic paintings refer to events in her personal life, expressed using images and scenes which mean a lot to her, but are not part of the standard iconography of art. She has explained many of these in a movie (Telling Tales), but it is perfectly possible to read her works in other ways. Peter Doig also uses unusual images in his paintings, as if in obscure narratives referring to movies such as Friday the 13th, although he does not always provide straightforward narratives for his work. If you would like to try this challenge, please study the painting below and – without trying to guess its title or look anything up – try to work out its narrative. Without external references, I would expect most to come up with at least two alternative readings, but you may well think of more. Nicolas Poussin (1594–1665), [name of painting withheld: see text] (c 1630), oil on canvas, 82.2 x 109.2 cm, Dulwich Picture Gallery. Wikimedia Commons. As this is a large painting, here is a detail, which I support with a verbal account and some very gentle clues. This painting by Poussin shows three figures at the foot of a small clump of trees, in a rolling, wooded landscape. Recumbent against the foot of a tree is a sleeping male, a warrior in his prime, clad in body armour, with a full-sized sword in its scabbard at his left, and a fine helmet further to his left. Other than the armour, he is lightly clad, in short trousers with bare legs and sandals, and rests on his shield. Leaning over him is an attractive young woman. She clutches a thin-bladed dagger in her right hand held, poised as if to strike, but hesitating. Her left hand rests on the warrior’s right hand, on the top of his head. She is wearing loose white robes over her upper body, which are cast back to expose her breasts, and a very long ultramarine skirt. Her feet are bare, and she appears noble. Her face has a look of anxiety and puzzlement. Clinging to her right arm is a naked winged cherub, who appears to be holding that arm back from striking with the dagger. In the next article I will reveal full details of this painting, and explain its narrative and origins. Posted in General, Language, Painting and tagged allegory, Botticelli, Cranach, Doig, icon, narrative, painting, Poussin, Rego, symbol. Bookmark the permalink.